The Lakers returned from a 2-2 road trip and ended a three-game home losing streak. LOS ANGELES (AP) — Xavier Henry, the fourth player to start at point guard this season for the injury-ravaged Lakers, scored 21 points and Los Angeles began another long stretch without Kobe Bryant by beating the Minnesota Timberwolves 104-91 on Friday night. The Lakers returned from a 2-2 road trip and ended a three-game home losing streak. 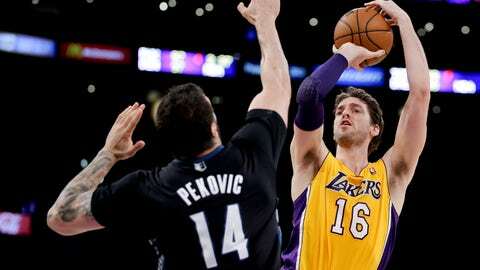 Pau Gasol, the only player to start all 26 games for the Lakers, had 21 points, 13 rebounds and eight assists. Nick Young scored a team-high 25 points off the bench, including a 4-point play that gave the Lakers a lead after Corey Brewer fouled him behind the arc with 2:37 left in the third quarter. Kevin Love scored 20 of his 25 points in the first half and grabbed 13 rebounds for Minnesota, but was held scoreless in the fourth quarter. Nikola Pekovic had 22 points and 13 boards, but Brewer finished with just five points after missing all eight field goal attempts. Point guard Ricky Rubio missed the morning shootaround because he wasn’t feeling well. He played 30 minutes, finishing with six points, seven assists and six rebounds. Bryant is expected to miss at least six weeks because of a fracture in his left knee, which occurred Tuesday night at Memphis when he fell to the court late in the third quarter of the Lakers’ 96-92 win. Fourth on the career scoring list, Bryant finished that game, hitting a clutch 3-pointer to help seal the win. But an MRI revealed the bad news on Thursday. 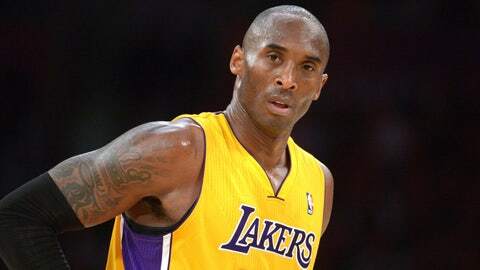 Bryant missed the first 19 games of the season while recovering from surgery to repair a torn Achilles tendon, an injury that occurred on April 12 — with two games left before the playoffs. The 18-year veteran, who last month signed a two-year, $48.5 million contract extension at age 35, made his return Dec. 8 and played just six games — all in a span of 10 days. He averaged over 32 minutes in the last three while shifting to point guard because of injuries to Steve Nash, Steve Blake and Jordan Farmar. The 39-year-old Nash, a two-time MVP who hasn’t played since Nov. 10 because of back and hamstring issues, has played as many games as Bryant — and will remain sidelined at least four more weeks with nerve root irritation in his back. Blake missed his fifth game because of a torn ligament in his right elbow, and Farmar sat out his eighth due to a torn left hamstring. Beleaguered coach Mike D’Antoni used his 11th starting lineup, and Henry shot 8 for 19 and had four assists in 42 minutes. The Lakers broke open a tight game with 3-pointers by Gasol and Young to help extend their lead to 100-91 with 2 minutes remaining. They outscored Minnesota 9-0 over the final 3:18. Love powered the Timberwolves to a 53-51 halftime lead, fueling an 18-3 run with seven points in a 1:50 span to help turn an 11-point deficit into a 51-47 lead in the final minute of the second quarter. NOTES: Henry was the 12th overall pick in the 2012 draft, by Memphis. His older brother C.J. was the 17th overall pick in the 2005 baseball draft, by the Yankees. … This is the first time since moving from Minneapolis to Los Angeles that the Lakers have failed to go more than a game over .500 through their first 26 games in back-to-back seasons. … Love has fouled out only once in 313 NBA games. It was against the Lakers on Jan. 30, 2009 — as a reserve — in a 132-119 loss at Minnesota.